From Gareth’s guide: The key to Vibrobot movement is a motor (or motors) that employs an unbalanced weight. Pager and other motors used to create vibration alerts in consumer electronics use this technique. As the motor shaft spins, the weight on the shaft, being off-kilter, makes the motor, and therefore the entire pager, vibrate. 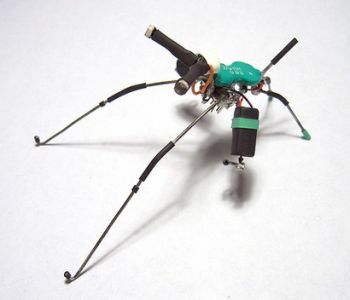 Hook such a motor up to a little robo-critter with four fixed legs, and when the motor fires and the weight starts spinning, the bot will skitter across the floor. That’s all there is to it. 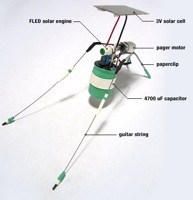 Since the legs don’t need to be articulated or driven, there are few mechanical challenges in building a Vibrobot. The power circuit is very simple too. The simplicity of the mechanics and electronics frees you up to put more effort into making the bots look incredibly cool. Terrifying robots most certainly aren’t anything new, and be it frightening or downright creepy, there’s probably a bot out there weird enough to freak just about anyone out. 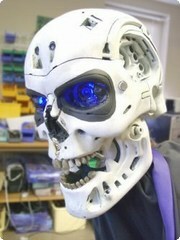 Enter Morgui, the University of Reading-based robot that has been around for some time, but is just now getting the credit a bizarre skull that follows humans around should. The creation, which consists of a disembodied head, oversized blue eyes, and a classically evil grin, has been officially banned from testing around anyone under the age of 18 (permission notwithstanding) by the school’s ethics and research committee, leaving the “Magic Ghost” to spook only mature audiences from here on out. Mo, as it’s so aptly nicknamed, sports a metal head, the ability to detect visual / auditory cues, and sensors for radar, infrared, and ultrasonic detection as well, but oddly enough, it cannot detect human emotion, so you better not count on this fellow to have sympathy on your soul when you’re screeching. The purpose of the machine is to judge how “people react to robots,” and when the bot just so happens to lack any form of facial covering beyond a skeletal structure, we’re sure the reactions are quite noticeable. “Your shoes, clothes and car are already made automatically, but your house is built by hand and it doesn’t make sense.” That’s word from Dr. Behrokh Khoshnevis, whose team at USC is getting ready to debut a $1.5 million robot designed to build homes with zero help from puny humans. The bot should have its first test run in California this April, where it will build the shell of a two-story house in 24 hours. The operation is akin to a 3D inkjet printer, with the robot moving about in three dimensional space, spraying out the home layer by layer. Part of the simplicity of the process comes from the simplicity of the materials: nearly the whole house is built with concrete and gypsum, obviously leaving a bit of work for the decorators, but allowing for complicated shapes and cheap construction — about a fifth of current costs. 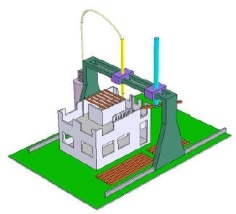 A rival robotic house building being developed at Loughborough University takes a week to build a home, but will include fancier designs, including ducts for water, electrical and ventilation. Unfortunately, we’ll have to wait around 5 years for that model to hit the market, and by then we’ll all be having so much fun driving around in our flying cars we won’t even have time to bother with these “home” things.